Login issue in latest PHP: If you experience the login issue please update as per these instructions. 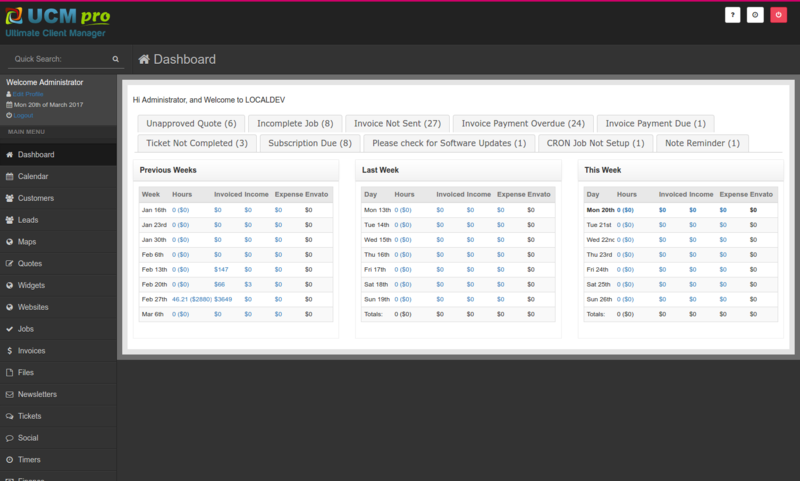 To Do List: Dashboard overview showing your TODO items (such as upcoming jobs, invoices that haven?t been sent, tasks requiring admin approval, new file uploads). Mobile Device View: Want access to the UCM on the road? This system comes with a cut down mobile friendly view. Try it from your phone to see! You can also disable the ?mobile view? and use the standard responsive layout if you wish. Easy Installer: Step by step product installer. Very easy to install and very easy to receive automatic product updates. Self Hosted: Host this system on your own internal server or public website hosting account. Job Task Discussions: You can email a Job to a Customer from within UCM. The email contains a special link the Customer can click, and then add comments to any Task in the Job. Great if you need feedback on quoted items or half completed Job Tasks. Open Source PHP Code: Fully open source PHP code. No encrypted obfuscated tricky stuff here. Change the code to suit your needs or create your own in house UCM plugins. Knowledge Base / FAQ: Have a list of Frequently Asked Questions display before a customer submits a support ticket. Group questions by product. Embed the FAQ listing in your own website. Free Updates: Pay once (helps the developers!) and receive ongoing updates. Please go to Settings > Upgrade to see a list of available updates, a list of changed files and version numbers will appear. 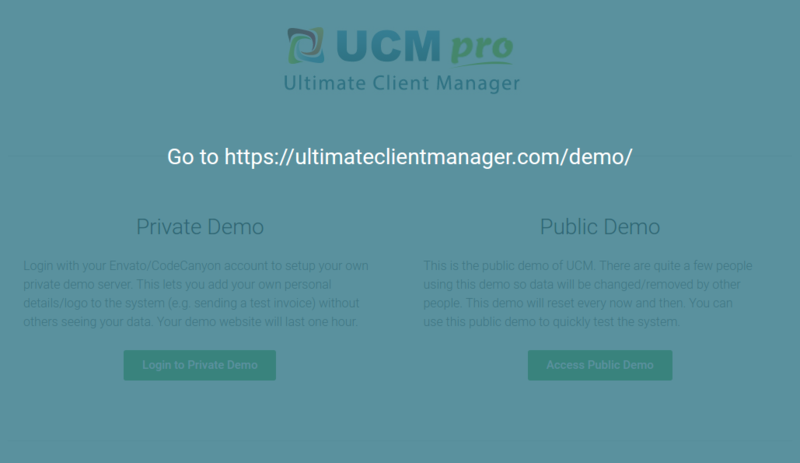 Session Management: The UCM system will show a list of active user sessions and allow the administrator to terminate any active user sessions. This is a great security feature incase you forget to log out on another computer. Change Request: Customers can “click & point” on any part of their website and request a change (eg: make the logo bigger). Change Requests appear within UCM for tracking and billing. Restrict number of changes. PDF Invoicing: Convert invoices into PDF documents. Email PDF Invoice to your customer straight from the system. Full control over invoice template layout. Send PDF invoices marked as ?overdue? or ?paid? as well. Task Timer: Create a Customer Job, add some Tasks to the Job, click the ?start timer? icon and away you go. Option to run multiple task timers at once. See active timers from any page within the system. Automatic Invoice Renewal: Choose an Invoice Renewal Date and UCM will email automatic PDF invoice renewals and overdue invoice reminders. Cool! Automatic Subscriptions: Create Subscriptions (eg: 6 Months Website Hosting) and assign them to Customers. UCM will automatically generate an email a PDF invoice to the Customer, and follup up with overdue notices when needed. Automatic Overdue Emails: Choose an Invoice Due Date and UCM will email automatic PDF overdue notices if the invoice hasn’t been paid. Accessing the online demo is easy, simply click the button below and login. The demo resets every now and then so feel free to add your own data and test out the features. A nice fresh look for UCM. If you have any problems installing the UCM please send a support question our way and we can help. Include your licence purchase code, a link to your website and your FTP details so we can set the system up for you if needed. This system runs on your own hosting server, this can be an in-house server or just on your own website (like I have it). This script will most likely not work on hosting accounts that have PHP “safe_mode” enabled. safe_mode is an old feature and it causes lots of problems with this script. PHP with IMAP functions enabled (for newsletter system and ticketing system) ask your hosting provider – godaddy shared hosting does not work, and they have many email problems anyway, I suggest using a different provider. If you require assistance please feel free to use our support system by clicking here. Please do not post support requests on the item discussion board – these are not checked regularly and your question may go unanswered for weeks.